Peptest reflux diagnostic kits are available in a choice of two or three sample tubes. Taking two samples at the right time and according to instructions offers extremely accurate results. However, in addition to collecting two samples when you are symptomatic, a third tube can help identify if you are prone to supine (or nocturnal) reflux. When someone suffers from supine reflux, tissue damage tends to be more severe and far more injurious than daytime reflux. Collecting three samples will provide you with our most comprehensive testing and results service and will enable you and your doctor to tailor the treatment and management of your reflux symptoms. To collect a sample you simply clear the throat with a cough and spit the resultant saliva into the collection tube provided, making a note of the time and any specific symptoms. Watch our video showing the correct way to collect a sample for Peptest analysis. The suggested times to collect your saliva samples depend on the type of reflux symptoms you are typically suffering from but samples should always be collected on a day when you are experiencing your symptoms. Symptoms that are usually associated with classical gastro-oesophageal reflux (GORD) or extra-oesophageal reflux (EOR) and occur at distinct times or are linked to a suspected reflux event include heartburn, hoarseness, lump in the throat, regurgitation, chronic cough, throat clearing, asthma attack, voice changes, trouble swallowing and shortness of breath. For these symptoms, it is suggested you take your first sample within 15 minutes of experiencing reflux symptoms and a second sample after a separate reflux symptom incident that is not within an hour of the first. The third sample should be taken within 15 minutes of waking up from overnight sleep and before eating or brushing teeth, ensuring you are in an upright position. Sample one should be taken in an upright position within 15 minutes of waking up from overnight sleep before eating or brushing teeth, the second sample should be taken one hour following the main meal of the day and the third sample should be taken one hour following the next main meal of the day. You then return your samples to the Peptest laboratory at RD Biomed for analysis and you will receive the results report within two days indicating whether each sample is positive or negative and the level of pepsin in each sample. You’ll also receive a letter addressed to your doctor explaining the results and what they mean. You should then discuss the next steps with your healthcare team as treatment will depend on your symptoms, the results of your Peptest analysis and any other relevant information. According to our recent Peptest Customer Survey, when asked ‘What did we really do well?’ many customers hailed our ‘fast’ and ‘efficient’ service with a quick turnaround of their test results. Thanks for your comment, Kevin. I would recommend you follow the instructions for continuous symptoms and take your samples after meals and one in the morning on waking. If you would like to discuss further please email us info@rdbiomed.com. Hello. I suffer from recurring subglottic stenosis , discovered during a fundoplication operation for LPR 2 years ago when they could not get the breathing tube in. I wonder if there could be residual pepsin in my throat causing the recurring, and would your test help establish if this is the reason for the stenosis years after the fundoplication, which should have prevented any more acid coming up and causing further damage? Thank you for your Peptest question. 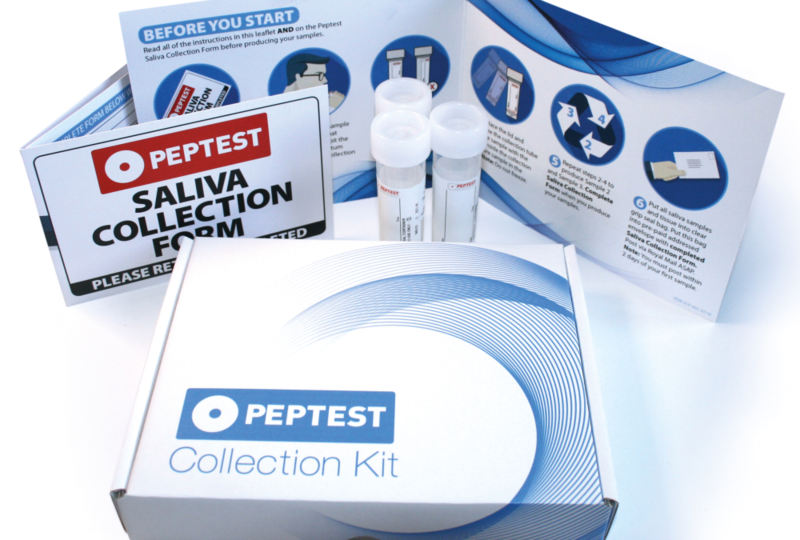 Peptest will detect the presence of pepsin in your saliva samples and because pepsin is only produced in the stomach, if it is found in the oesophagus, the throat, the mouth or the lungs – then we know it has been refluxed. You can continue to use the Pantoprazole, this will not affect the test as Peptest will still detect pepsin in the presence of PPI or H2 receptor antagonist therapy if pepsin is being refluxed. I have been very poorly with possible silent reflux for five months and I have lost my voice and have swallowing difficulties and now only manage sieved soups due to the inflammation. They have been unable to use an endoscope due to the dryness of the throat and breathing difficulties. Since this came on very suddenly I produce very little saliva and have dry irritated mouth. I am desperate to find out if it is LPR and so I have seen your test. But how much saliva do you need in the sample bottle as I have very little. Many thanks. To analyse a saliva sample we require approximately 1ml of sample. Within a Peptest kit full instructions on how to produce a saliva sample and the required volume are included. I am taking Zantac bid. Do I need to stop this prior to my Peptest ? We recommend that you stop taking antacids and raft-forming / alginate suspensions such as Gaviscon for 48 hours prior to collecting samples for Peptest analysis. However, you do not have to stop PPI or H2 receptor antagonist therapy (Zantac bid / Ranitidine) as Peptest will still detect pepsin in the presence of these if pepsin is being refluxed.